Broom needn’t be the start or end of your Savannah Way adventure. Further down the coast, you’ll find all manner of delights to keep you travelling indefinitely. What could be more enticing than 80 miles of beach? 136 miles, of course! 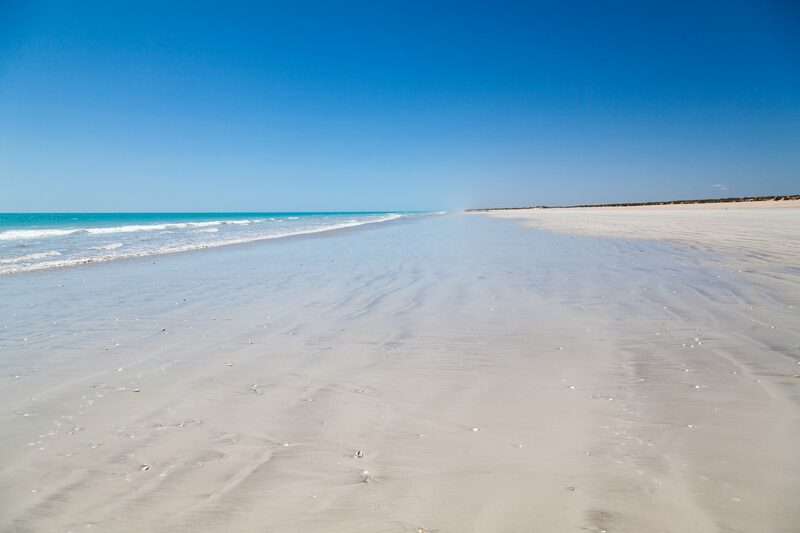 The Eighty Mile Beach Marine Park has 220 kilometres of beaches that feature vast stretches of white sand, rocky shores, seagrass meadows, creeks and mangroves. The turquoise waters are popular for beach fishing (taking into account bag, size and season limits), but there are a range of activities to keep you busy, including camping, walking, swimming, bird watching, and four-wheel driving. Threadfin salmon and blue nose salmon are commonly caught here, so anglers should prepare themselves for a heavenly fresh feast! If you’d prefer to watch, rather than eat the local wildlife, keep your eyes peeled for wading birds, turtles, sawfish, dugong and dolphins, all of whom are very much at home in this part of Western Australia. As the sun sets, make tracks for the sand dunes for a perfect view. Next, head further south along the coast until you reach Port Hedland, which will impress you in a different way. Here, it’s all about drama: large-scale industry abuts breathtaking natural beauty, while traditional local Aboriginal culture is rich and thriving. There are more that 31 Aboriginal language groups in the Pilbara region. The Kariyarra people call Port Hedland ‘Marapikurrinya’; ‘mara’ means hand, ‘pikurri’ means pointing straight and ‘nya’ is a location marker. The name refers to the hand-shaped formation of the tidal creeks, which, in the Dreaming, were created when a creation spirit arose from the landlocked area of water. Today, traditional law and custodianship are still essential to Aboriginal cultural identity in the region. Take a trip to Two Mile Ridge, where you can see original ancient petroglyphs (rock carvings) depicting fish, whales, turtles and bird tracks. Make sure you visit the Department of Aboriginal Affairs on Wilson Street first, as you’ll need a key to access this protected site. For a completely different experience, check out the port area, where bulk carrier vessels of up to 260,000 tonnes and over 230 metres in length enter the harbour alongside the main street. On the Port Interpretive Walk along the Esplanade, you’ll find plenty of information on the port’s history and current operations. Head to Marrapikurinya Park for the best views of the bustling industry of the port, or visit Redbank Bridge for a great view of BHP Billiton’s extremely long trains (up to three kilometers!) taking iron ore to the port, as well as Dampier Salt’s towering white mountain. But of course, a trip to this part of Western Australia would not be complete without visiting Karijini National Park. Karijini is on bucket lists around the world, and for good reason. Its spectacular rugged scenery, ancient geological formations, numerous ecosystems and recreational opportunities make the park an unforgettable experience.